On September 15, HHF sponsored and exhibited at the 92 St Y StreetFest on the Upper East Side of Manhattan. 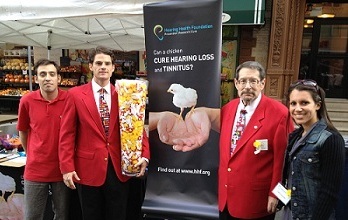 HHF staff members and volunteers from the Royal Arch Masons, a HHF major donor, had the opportunity to speak with thousands of New Yorkers and discuss how a chicken can lead us to a cure for hearing loss and tinnitus. Chickens (and most non-mammals) can regenerate their own hair cells and as a result restore their own hearing. We explained how our Hearing Restoration Project is working to translate this process to humans in order to develop a biologic cure for hearing loss and tinnitus. Attendees were also provided the opportunity to enter a contest to win a $50 Target gift card by guessing the number of fuzzy chicken toys in a glass jar. The winner of the contest hit the nail on the head by guessing 750 chickens! Our booth also featured an abundance of Peeps (chick-shaped, marshmallow candy), chick temporary tattoos, and a plethora of information about HHF’s work toward a cure for hearing loss and tinnitus. HHF was honored to be a part of this event to spread the word about our work. We are also extremely grateful for the support of the Royal Arch Masons for their generous help at this event and their continued support of HHF’s Emerging Research Grant Awardees studying central auditory processing disorder (CAPD).